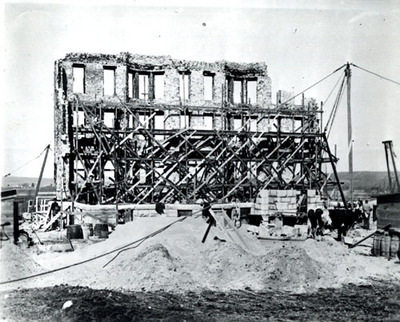 In rebuilding College Hall, soon to be renamed Davis Hall, the remaining portion of the west façade was incorporated into the new building. Note the complex wooden scaffolding, and the block and tackle pulley system used to position the granite blocks in place. The new building was completed by the fall of 1896.